Buy now for a Magical Holiday Display that will bring smiles to everyone’s faces! Decorate your front yard for the holiday season with this Airblown Inflatable Mickey with Santa Hat. This festive, life-size lawn ornament features Mickey Mouse in a green and red Christmas outfit waving to all your friends and family. Mickey is made of 75-percent fabric, 15-percent plastic and 10-percent metal materials. It is simple to set up and will transform your home into a winter wonderland. After the holidays, deflate it and pack it away for safe keeping to use again the following year. Includes 4 base stakes, 4 tether stakes/ropes, 1 Airblown Inflatable, 1 extra light bulb and fuse. 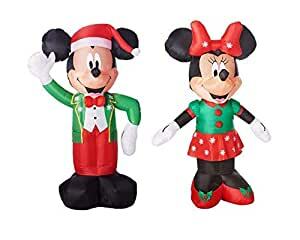 Show your love for the holiday season with the Gemmy Industries Airblown Inflatable Mickey with Santa Hat.